With our new auction format in full swing, QuiBids now offers customers more products than ever before. That means hosting more auctions, but it also means that we can offer a wider selection of products at any given time at the QuiBids Store. And with more products comes the need for more informed shopping, and that’s where our newest site feature comes in. It’s called QuiBids Reviews. In the past picking out a specific item —let’s say a tablet for instance— on QuiBids was easy because we only offered maybe one or two different kinds. These days we might offer up to twenty or more different tablets and electronic readers at any given time, so you guys —as customers— would clearly benefit from a resource that lets you talk shop; to compare and contrast one product from the other and to help you with your decision making when it comes time to step up to the auction block or Buy Now. We’re excited to say that QuiBids Reviews is that resource, and it’s now live on the site! How do I use QuiBids Reviews? We’ve added a “Reviews” tab at the bottom of every auction page and product page (look here for a refresher on the differences between a product page and an auction page). From there, you can view an aggregated score [See (1) on image above] on a scale of one to five stars and you can even see exactly how many times the product was given a specific number of stars [see (2)]. You can also sort by positive reviews that were most helpful (as voted on by other customers) and the most helpful critical reviews [see (3) above]. 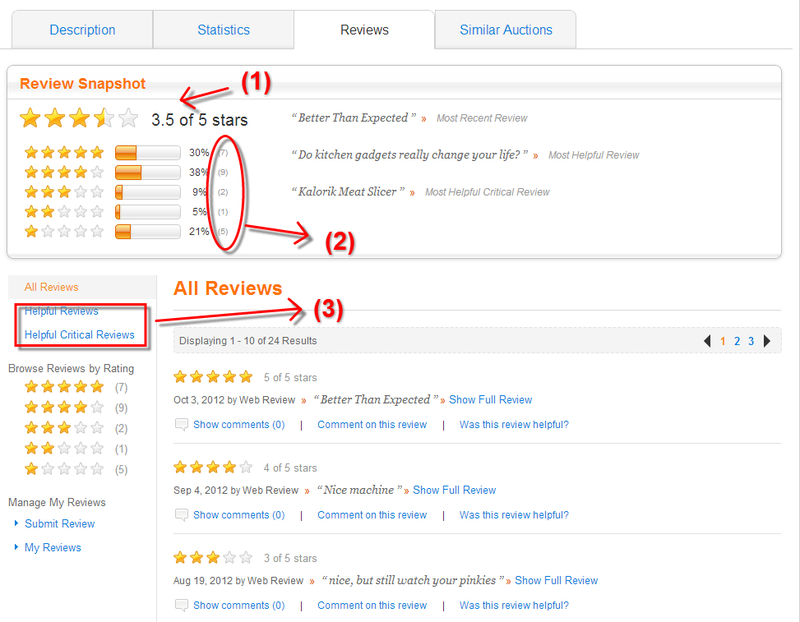 You can also search by Reviews within the QuiBids Store and view the star ratings as they appear on auction panels. We encourage our customers to chime in by commenting on other customers’ reviews and voting them as helpful or not helpful [See image above]. Those are two great ways to let your voice be heard without even submitting your own review. How do I submit my own review? First off, we encourage all of our customers to write reviews on every product they win or Buy Now here at QuiBids! Your experiences with our products will help inform your fellow customers’ shopping practices, so think of it as a common customer-to-customer courtesy. You must give the product a rating of one to five stars. You must title your review. You must write what you think about the product, using no more than 10,000 characters. That last task is pretty subjective to your experience, so here are some guidelines that will help you to write the kind of review that is especially likely to get published on our site and be helpful reading for your fellow customers. 1. Allow yourself enough time to use the product before writing about it. Knee-jerk reactions are easiest to get to, but you should try your best not to write a whole review based on them. Spend some time using the product until you grow comfortable with it and confident enough to discern its limitations from its stronger suits. 2. Focus on the product exclusively in your review. People don’t read Reviews to learn about QuiBids’ auction model, how long it took for you to receive the product, or the killer deal for which you won it. They want to know about the product itself, so save your anecdote about how you won it using all the Voucher Bids you won playing Word Scramble for another time. 3. Tell about your expectations for the product, and how it measured up to them. 4. Please consult our rules for Reviews. A quick read through the rules we’ve set up to govern QuiBids Reviews will help you understand exactly the sort of content that will be helpful to QuiBids’ customers. For more about writing a good review, check out our Help pages.